Tamarack is a conifer of Minnesota lowlands and bogs that has the distinction among conifers of being deciduous. Tree height can reach 40 to 80 feet with a straight trunk, diameter of 1 to 2 feet but some trees can be much larger. The national champion Tamarack, as of 2018, is located near Brainerd MN and scores 234 points with a height of 67 feet and a circumference of 150 inches. None have yet been nominated for the Minneapolis Heritage Tree list, so its possible one in the Garden could qualify. The crown is a narrow pyramid. Branches are horizontal to ascending. It self prunes and older trees will be bare for much of the lower trunk. 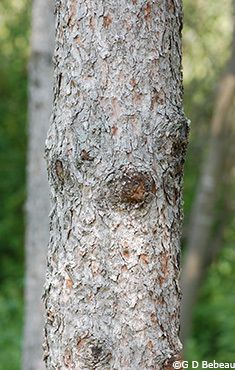 Bark is reddish brown, thin, smooth when young, then gray and scaly with age. Twigs are stout, hairless, orangish-brown with many short spurs. Leaves: The new needle growth begins in early spring, forming, after the first year, as tight spirals of 10 to 20 needles from dark red buds, on short spur branches. First year leader twigs will have single needles arranged alternately. Needles are 3/4-1 inch long and 1/32 inch wide, very soft and appearing flat but actually 3-angled being slightly rounded on one side. A resin canal is visible as a lighter color linear band in the needle. The needles turn gold in the Autumn and by spring are usually dropped or blown away by winter winds. 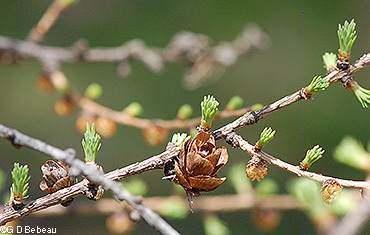 Flowers: Tamarack is monoecious, that is, it has separate male and female flowers. Male flowers are yellowish and are rounded at first, appearing near the branch tips. 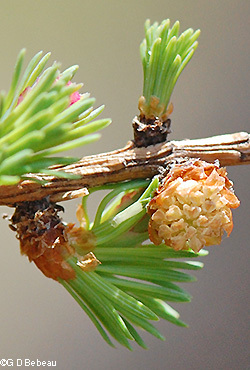 Female flowers are initially rose-pink and then turning brown into egg-shaped, upright cones that are small, 1/2 - 3/4 inch long, with very short and usually curved stalks; they fall off in the second year. Seed: Cones contain paired brown long-winged seeds that are usually wind dispersed before the cone falls from the tree. Seeds are only viable for one year. Cone production only begins around 15 years of age, but in dense groups of trees, not till 40 or 50 years of age. 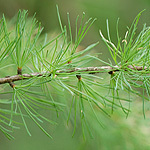 Habitat: Tamarack is found in wet to moist poorly drained soils in cold climates. It is not tolerant of shade and is often the first tree to colonize an open moist area. The root system is very shallow, but broader than the crown, but still makes the tree susceptible to blow-down. 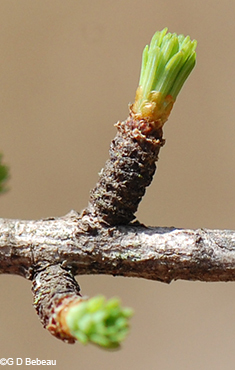 Older trees are subject to infestation and defoliation by the Larch sawfly (Pristiphora erichsonii) and by the Larch casebearer moth (Coleophora laricella). Names: The genus Larix is the classical name for this tree. 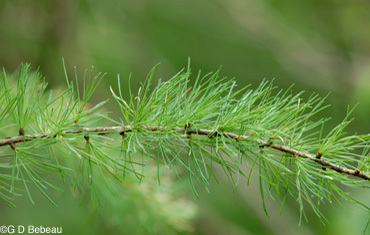 The species laricina is almost a duplicate, meaning 'larch like'. 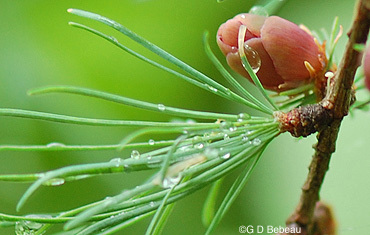 In the 19th Century the tree was classified as Larix americana. The author names for the plant classification are: The first to classify was ‘Du Roi’ who is Johann Du Roi (1741-1785) German botanist who studied the flora of North America, was professor of botany in Berlin and the first to describe the Larch. His work was amended by ‘K. Koch’ who is Karl Heinrich Emil Koch (1809-1879), German botanist, Professor of Botany, first professional horticultural officer in Germany, plant collector in and near Asia Minor. 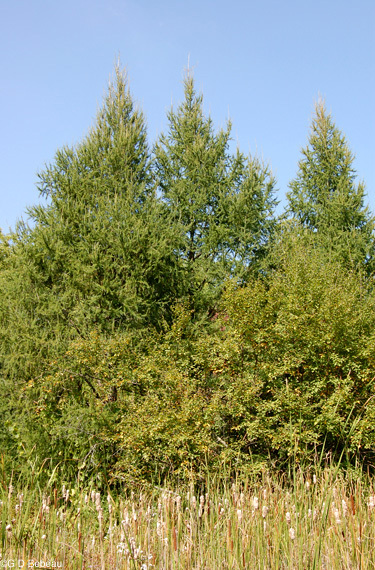 Comparisons: The only other deciduous conifer that can be found in Minnesota is the European Larch, L. decidua, but that has been introduced via landscape plantings and is not to be expected in the wild. It has gray to yellowish twigs and cones without stalks. Above: The stand of almost bare Tamarack trees in the marsh area of the Woodland Garden in early April as the buds are beginning to put forth new needles. Note the slim trunk diameter. In late summer the tall Tamaracks still show there green needles when other vegetation is turning to fall color. Below: 1st photo - By the end of May the needles are fully formed. The clusters of 10 to 20 grow from short spur shoots, that remain on the branches providing easy identification of this species. 2nd photo - Fresh green shoots beginning to grow from the short spur shoot of the branches and twigs in the later part of April. A prior years cone remains and yellow male flowers are forming. Above: The egg-shaped female flower is rosy-pink initially. Below: 1st photo - The maturing cones, which are only 3/4-1 inch high on very short usually curved stalks. 2nd photo - The yellowish male flower. Below: 1st photo - Bark is reddish brown, thin, smooth when young, then scaly as shown here. 2nd photo Note the light colored resin band in the needles. 3rd photo - the short stub from which new needle growth occurs. Below: After most other trees have dropped their leaves, the Tamaracks have turned to a golden yellow before the onset of winter. Some needles will remain until spring. Notes: This plant is indigenous to the Garden area. Eloise Butler catalogued it on April 29, 1907. 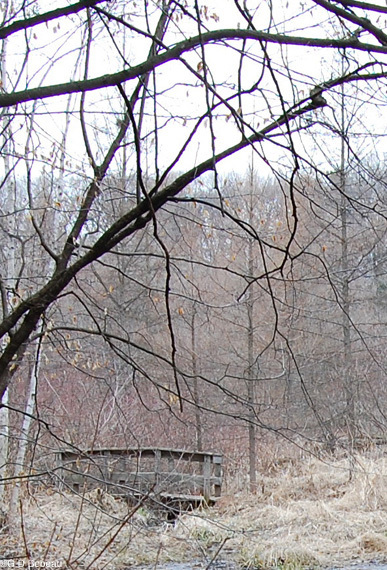 The marsh area of Eloise Butler Wildflower Garden was originally a Tamarack Swamp. Replacements were needed as severe wind storms of 1925 had destroyed most of the Tamaracks in the Garden and a saw fly infestation took care of the remainder. Martha Crone planted a number of them in her years as Curator. Seven small ones were transplanted from the Quacking Bog in 1934; one in 1935, 4 in 1936, 1 in 1938; more in 1948 and '49. The larger specimens growing now could be some of those trees. The small group of trees is located at the north end of the wetland path near guidebook stations 23 to 25. Ken Avery noted planting the tree in 1977. Since the early 1980s, native trees have been purchased to restore the tree canopy of the woodland garden after the loss of all the elms and the removal of Buckthorn. Tamaracks have been included. Thirty were planted in 2010. In the United States, Minnesota is the western most outpost of this species, growing around the Great Lakes and up to New England. It is primarily a tree of the Canadian boreal forests. Within Minnesota it is found in various counties in the northern 2/3rds of the state, which includes the metro area. Lore and uses: The wood of old trees is very durable, used for framing houses, railroad ties, poles, etc. Early New England ship builders used the roots as "knees" in building small boats. There is also medicinal use. Densmore (ref. #5) in her study of the Minnesota Chippewa reports that finely chopped inner bark, fresh or dried, was useful on burns if applied in the morning, then partially washed off at night and renewed. The bark was also said to used for a laxative, a tonic and a diuretic. The active ingredient is a volatile oil that contains pinene, larixine and the ester bornylacetate.